The area near Eugene offers a wealth of possibilities for the perfect wine tour excursion for any group. This region offers many choices in types of wineries – from large nationally known wineries such as King Estate, all the way to smaller boutique style wineries such as Noble Estate and Chateau Lorane. The feel here is still very uncommercial – these are tasting rooms attached to wineries, not wineries attached to tasting rooms, which has become all to common in more commercialized areas. This offer is for a 5 hour tour departing from Eugene. We also include complimentary bottled water, soft drinks and lots of ice. We even get you started with champagne and juice on the way out to the wine country! Your chauffeur will also take digital photos along the way, which will be posted to Facebook for free downloading. 12:00 pm – We pick you and your party up at your chosen location (Eugene area). Your time starts when we pick you up, no matter where that is. Your chauffeur arrives in a freshly cleaned, late model stretch limo or Party Bus, stocked with complimentary bottled water and soft drinks. 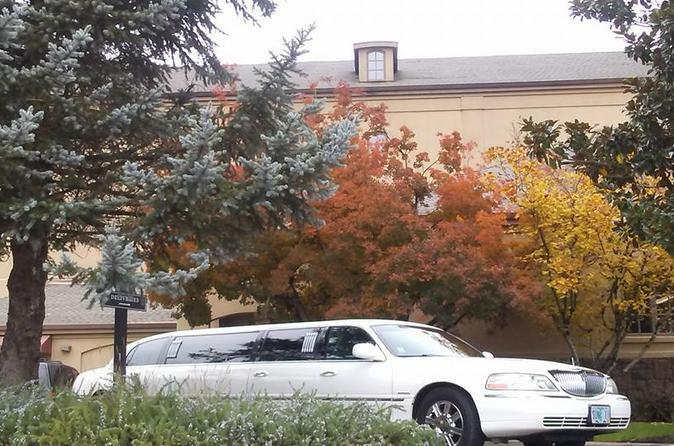 1:00 pm – Welcome to King Estate Winery! One of Oregon’s premier wineries, King Estate wines have been served at White House dinners. Enjoy the breathtaking views from the hillside location while tasting some of the finest wines in the world. 2:15 pm - Silvan Ridge/Hinman Vineyards. Renowned for their Pinot Noirs, Sylvan Ridge offers a picturesque tasting room and very friendly servers. 3:15 pm – Noble Estate Winery. A local gem. offers unpretentious tastings of its full line of delicious whites and reds, with a beautiful picnic area, fantastic view looking over Fern Ridge lake. 4:15 pm – Enjoy the scenic ride home toasting your friends enjoying a nice Pinot purchased earlier.